A first of its kind whitewater park in Petoskey's Bear River Valley Recreation Area brings paddlers from across the country to enjoy the rush of water leading into Northern Michigan's Little Traverse Bay. Wow: this park is spectacular! What once was a gentle, flowing river loved by canoeists has been transformed into a rockin' and rollin' ride along the Bear River. A number of features were added to the river including large boulders, roll overs, ledges, logs, and tight squeezes during the $2.4 million renovation of the Recreation Area. Moving quickly below steep bluffs lined with trees, river riders find it hard to believe that the city surrounds the park. The river drops through an elevation of 80' during the whitewater run with a rapids classification of 2.5 on a scale of 1.6. During periods of rain, the river can turn into a 3-4 class rapids. The rapids begin near the Sheridan Street bridge and drops three miles through the spectacular park and ends at the mouth of the Bear River on the Little Traverse Bay. There are numerous put in locations along the river. 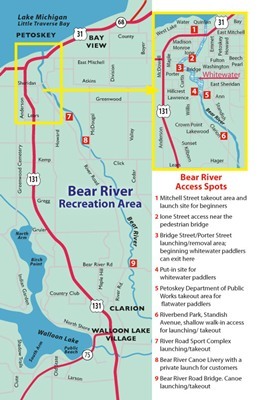 The Bear River Valley Recreation Area is located in downtown Petoskey and connects to the waterfront area and marina.